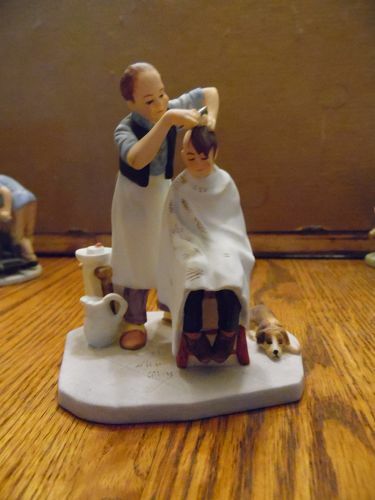 Gorham Norman Rockwell collectible figurine, Shear Agony, Gorham, Brown & Bigelow Calendar 1963 Norman Rockwell inspired limited edition "Shear Agony" ceramic figurine, of a boy getting a haircut. Made in U.S.A. This is in perfect condition, would be a great decoration in a beauty salon or barber shop. #2175 of 15,000 made. Made of bisque porcelain and in perfect condition, no original box. About 4 1/4" tall. I will be adding a lot of Rockwell items, so check back. I do combine shipping if you see something else. I pack extremely well.